Peter Decherney, Professor of English and Cinema Studies. is featured in The Pennsylvania Gazette's article, "Film for Social Change," along with John Jackson, Richard Perry University Professor of Communication, Africana Studies, and Anthropology, and Nicholas Escobar, who graduated from the College in 2018 as an English major. The article explores how Penn students from a variety of disciplines are learning the essentials of film storytelling and production while helping to give a voice to marginalized people and communities. 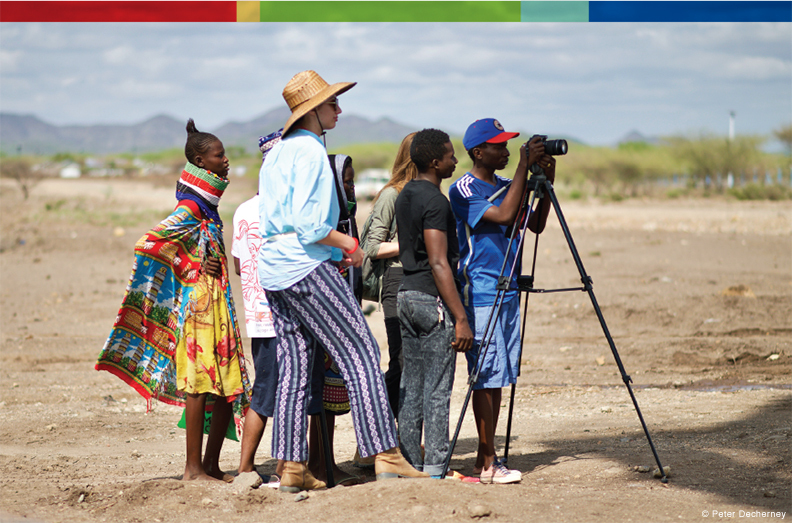 Decherney has led projects with undergraduate and graduate students in Kenya and Puerto Rico. The trip to Kenya in July 2017 was a partnership with FilmAid International to make several short informational documentaries designed to educate new arrivals at a local refugee camp about UN services in areas such as education, health, livelihood, safety and protection, water and sanitation, food distribution, and firewood, as well as the VR movie about the primary school. The trip to Puerto Rico in summer 2018 focused on virtual reality filming, with the students both through teaching at schools and at different organizations in Puerto Rico and working with Puerto Rican filmmakers to shoot their own VR film. Featuring Peter Decherney, Nicholas Escobar, John L. Jackson, Jr.